Living high in the Rockies is a real treat. In some ways it can be a challenge, but it’s well worth the effort. Tasks like growing vegetables, managing critters, building, cooking, and managing the household several miles from any stores are all just a little bit different high in the mountains, but minor adjustments to the routine makes life work. After moving to our new location at almost 9,000 feet in 2015, we have been putting into practice many of the things learned in our previous efforts and are combining them with new ways to plan, implement and enjoy our new home and garden at a higher altitude. Here we will share our successes and our failures, and hopefully add new insights for your projects as well as gain new techniques from you, to add to our own. Welcome to High Country Living! With a short growing season, challenging weather, and intense UV rays, it’s an investment of extra time and effort to produce a healthy garden. Pests include deer, rabbits, and pesky ground squirrels. The soil, if not amended, is alkaline and quite rocky. (After all, it is called the “rocky” mountains.) The dry mountain weather and wind evaporates water quickly. Hail can destroy a garden on a moment’s notice. Spring turns to summer without much buffer time, and summer turns to fall quickly as well. The morning lows in summer rarely reach as high as 50 degrees, and it is possible to find freezing temperatures at any time in the summer. But, if willing to work with the challenges, gardens can thrive. In addition to growing vegetables and fruits, we are also raising ducks for our eggs. We’ve learned quite a bit about raising ducks in our previous location and now higher in the mountains, and we offer our insights to duck life in the Rockies. Currently we have six ducks, hatched August 1, 2016, a variety of five different breeds. We average 4-5 eggs per day in the prime lay season. I enjoy cooking and baking and have been learning techniques and new recipes that work well in this high altitude. I’ve been perfecting my sourdough baking techniques and baking most of our bread. I preserve as much food as I can, in as many ways as I can. I’m constantly trying new things in the kitchen, and will be sharing what I learn. In addition to finding the best ways to cook in this altitude, I have also been researching good nutrition. My conclusion is to follow the concepts found in Nourishing Traditions, by Sally Fallon and Mary Enig. As I explore and create new recipes following these principles I will share them here. We call our little oasis “Golden Gaits Ranch.” In addition to our garden and ducks, we enjoy our three horses, dog and cat. Our horses are one of the reasons we wanted to live in the high country, and finding new places to ride was what brought us to this location. Training and riding are a passion of ours, and Tim has developed quite a knack for training the horses. Tim built our home himself (with a little of Laurie’s help). We designed it together, a 14-sided “tetra-decagon”. Think permanent yurt. Tim is also a woodworker, and is currently building our custom kitchen cabinetry. Tim keeps up the Golden Gaits Ranch website (ggranch.net), which includes information on horsemanship, woodworking, as well as projects involved with building up and maintaining the property and garden, while Laurie focuses on the “High Country Living” aspect of our home and gardening projects. The phrase, “Listen to Him”, puts the focus on what we believe is most important: listening to Jesus and following him, as our Father and Creator has instructed. Father audibly spoke, “This is my beloved son. Listen to him.” (Mark 9:7) Jesus came to earth to show us the Father. He said, “He who has seen me has seen the Father”* and, “The word which you hear isn’t mine, but the Father’s who sent me.”* The words Jesus spoke and the life he lived on earth were given us by Father, so we would know the Father, and know how to live our lives in the present. We aim to live our lives accordingly, and this is far more important to us than gardens, horses, ranch projects or anything else. *These references are found in the Gospel of John. For a better idea of what we believe, carefully and thoughtfully read the entire Gospel of John. 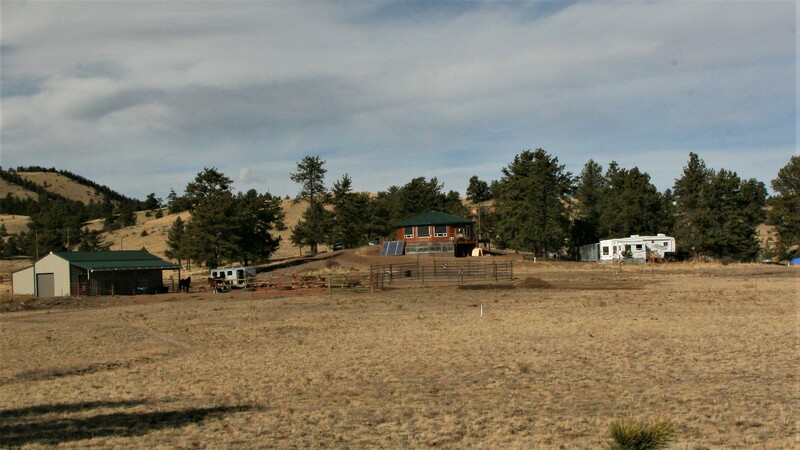 CLICK HERE for the current weather and forecast here at Golden Gaits Ranch. Feel free to send us an email if you have any questions or comments!